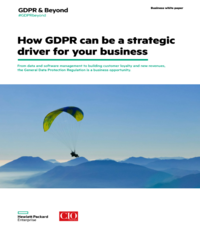 The world’s toughest data protection regime – the European Union’s General Data Protection Regulation (GDPR) comes into effect today, and with it the possibility of huge financial penalties for non-compliance. Privacy experts here believe many large Canadian-based enterprises who regularly do business in Europe are prepared, while a large number are close. But many small and medium-sized businesses are way behind. So here’s two pieces of advice on what to do on this Day 1 from those who know: Don’t panic, and get on with it. “Let’s not freak out,” Lauren Reid, who runs her own consultancy called The Privacy Pro, told the annual Canadian convention of the International Association of Privacy Professionals (IAPP) in Toronto on Thursday. She acknowledged there are differences between GDPR and Canada’s Personal Information Protection and Electronic Documents Act (PIPEDA). But, she added, they try to achieve the same things. In fact, she added, it’s built on same principles of Canada’s Personal Information Protection and Electronic Documents Act (PIPEDA), which includes giving people notice personal data is going to be collected, choice of saying no, transparency on what is being collected and detail on what the data will be used for — in other words, privacy and data protection. Rules for proving proper consent for collecting data was obtained may be different under PIPEDA and GDPR, but Reid noted firms here have the experience and tools under the Canadian Anti-Spam Law (CASL), so should be ready for more stringent rules. “For many organizations, GDPR doesn’t apply,” Reid added, although it may end up affecting them as PIPEDA and provincial privacy laws are expected to be amended to come close to GDPR. If Canadian laws aren’t found adequate by EU regulators then companies won’t be able to transfer personal data back and forth. In fact, Reid said, the number one misconceptions is that Canadian laws are already adequate so GDPR doesn’t apply. Not true. Canadian laws were adequate on data transfers with the old EU privacy laws. Another misconception is GDPR introduces new security requirements that have to be met. It only demands “appropriate technical and organizational measures” to protect personal data. How soon the EU will decide adequacy isn’t clear. Canadian privacy commissioner Daniel Therrien says Canada’s adequacy will be decided by 2020. However, Constantine Karbaliotis, leader of managed privacy services at PwC Canada and a member of the GDPR panel on which Reid was speaking, said one European told him it could be decided by the end of this year. We don’t want to get European regulators riled up against Canadian companies, he said. When transferring data with personal information to a third party in an EU country use a model contract. Panel member Jennifer Stoddard, former federal privacy commissioner and now regulatory advisor to Nymity, a Toronto privacy management software firm, warned that after the Edward Snowden revelations about U.S. online surveillance capabilities Europeans no longer look at Canada as a privacy-friendly country. That’s because we are partners with the Americans, the British, the Australians and New Zealand in the Five Eyes intelligence-sharing co-operative. In a separate panel on GDPR, a German and two Canadian experts went over the similarities and differences between PIPEDA and the new EU regulation. Echoing what others have said, Berlin technology and media lawyer Fabian Selp noted many EU countries still haven’t passed GDPR enabling legislation No organization is 100 per cent complaint at this stage, he said, and won’t start handing out fines immediately. However, he added, affected companies must show they are on track to being compliant. That means having evidence of a plan (documentation, a budget), doing a data inventory and appointing a data privacy officer, assessing risks. He believes a “significant proportion of large sophisticated multinationals” based here are very close to good compliance. SMBs, though, are still trying to figure out if they’re affected. While Europe told the world two years ago GDPR was coming, a number of Canadian firms apparently just woke up. “I’ve had dozens of calls in the last week, ‘Can you help me with this GDPR thing?”’Karbalioti said.